‘Marilyn Tower’ Planned for L.A.
You may have heard of the ‘Marilyn Monroe Towers’ apartment complex at Mississauga in Ontario, Canada. But as Steven Sharp reports for Urbanize Los Angeles, another architectural tribute is being planned right in Marilyn’s hometown. 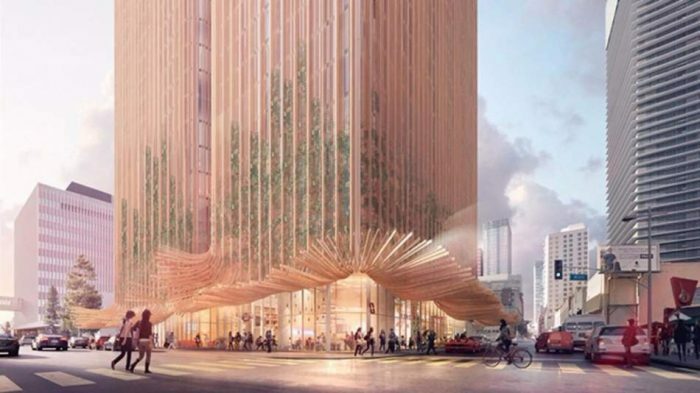 “A proposed high-rise development in Downtown’s booming South Park neighborhood takes inspiration from California’s famed Redwood trees. The project, the first in Los Angeles by the Australian developer Crown Group, would replace a mid-century warehouse at the southwest corner of 11th and Hill Streets … A revised plan, calls for a larger 70-story edifice designed by Sydney-based Koichi Takada Architects.